This quote from Stella Adler captures her distain for what later became known as “Method Acting”, developed by Lee Strasberg. Adler, along with her mentor, Konstantin Stanislavski, came to believe that extensive research, not emotional memory, which formed the foundation of “method acting”, was required in the development of an actor’s character. The belief was that an actor’s depth of experiences were too narrow to play most roles and, therefore, “emotional memory” was insufficient to create a complete character. Stella Adler (February 10, 1901 – December 21, 1992) became one of the most influential teachers of acting theory, an influence that spread with the founding of her school, the Stella Adler Studio for Acting, along with other schools that have been opened to teach her methods. 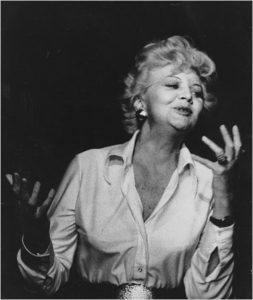 Her influence was further spread with her authorship of several books, including The Technique of Acting and The Art of Acting, as well as the popularity of her methods, which built upon the teachings of Constantin Stanislavski and was influenced by her work at the renowned Group Theatre.